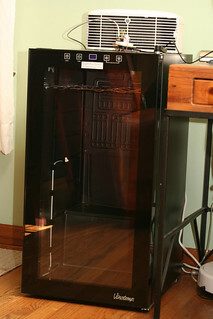 I chose this fridge because it has a temperature range of 39ºF to 65ºF, which is an ideal range for meat curing. Controlling the fridge directly is not necessary. The freezer temperature controller works great. I just wanted to control the fridge with a micro controller because I am a huge nerd! For the humidity, I am using a Crane Drop humidifier. I chose this humidifier because it’s ultrasonic, so supposedly the water molecules in the air are smaller (or so I’m told). 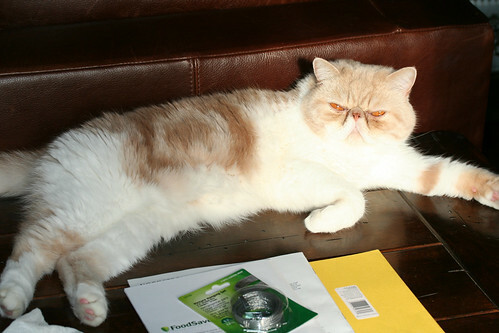 More importantly, the humid air it produces is not heated, so it will not impact the temperature of your box as much. The wire racks I have in the box are not stainless, so it’s important not to let the salami touch the metal (otherwise you get a metallic flavor). So I use a bunch of clothespins to hold on to the string that ties off my salami. 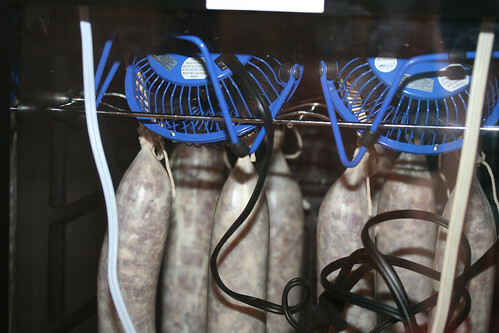 So far, I’ve found the best place to put the fans is above the meat pointing down. 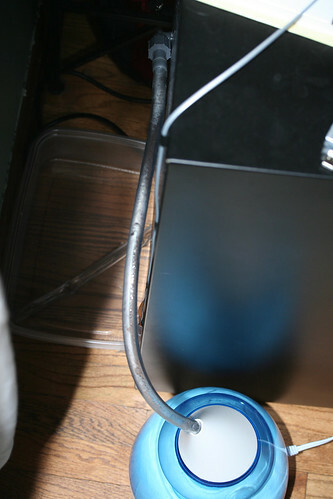 I found I couldn’t get good air circulation in other places. The fridge cost me about $200. The humidifier and controllers ran about $150 together. I estimate the total cost was about $400 when I was done. The freezer controller can perform in the correct temperature range for curing meat, so one way to save money on this project would be to buy a used fridge from craigslist or something. Another possibility is to buy a Temperature and humidity sensor. It requires a bit more assembly, but is cheaper than buying both the freezer controller and the humidity controller. 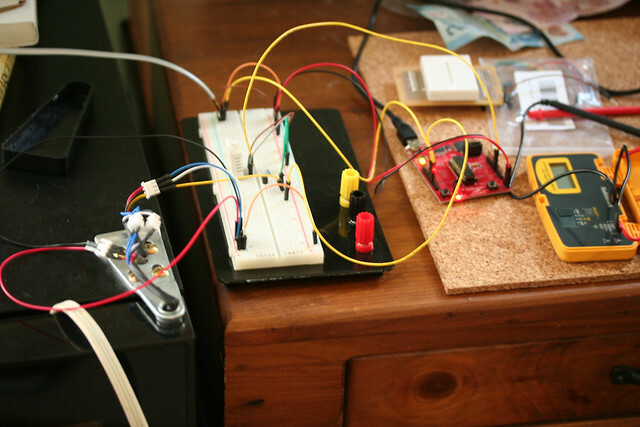 With a microcontroller, there are even more possible solutions. It just depends on how much you’re willing to spend, and how much you want to assemble yourself. I hope you’ve enjoyed this post! 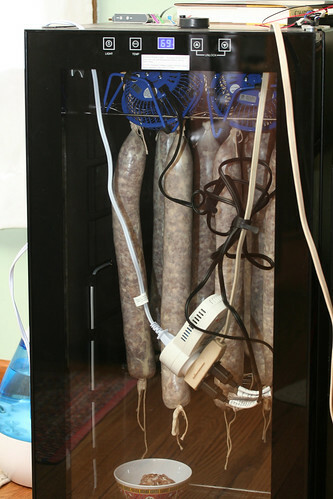 I think my next post will be “Hacking your sausage box” (how to hack the Vinotemp wine cooler), followed by “Real Time Sausage Monitoring” (publishing and monitoring sausage info in real time). Copyright © 2018 Tenderlovemaking.com All rights reserved.